Did you ever use the wrong word, thinking it meant something else. Come on now I'm sure I'm not the only one this has happened to. But I'm damn good at Scrabble. And I don't even have to check the dictionary. 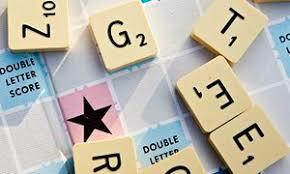 When challenged I just speak confidently in a loud voice "Yeah, that's a word, it means..." It's what I do when playing with my wife, especially, who is Francophone and deigns to play in both official languages. See what I just did there? I misused "deigns". I should have said "who forces me to let her create French AND English words". Now just how do I, an Anglophone, challenge those French words. Well I just have to say I love her and I trust her. She wouldn't cheat. Not like me. One of the words I've misused up until now is temerity. I used it when I thought someone was timid. I thought temerity meant something like frightened. Who knew? Turns out it means bold or impertinent. A synonym is cheek. No, trust me. I don't even need the dictionary. Who knew? Well, actually, I guess the rest of you did. I guess I had the temerity to play Scrabble after my own fashion. Temerity/cheek were the prompts at Two Word Tuesday this week. Did you guess? That's cheeky of you, John! I know. And if I'm caught out I just turn the other one. I had the same misconception of "temerity" until researching this prompt pair. I pretend that I have an impressive vocabulary, but I look up every word... just to be sure. I have to say I do the same Tara. Otherwise my posts might be pretty embarrassing some times.